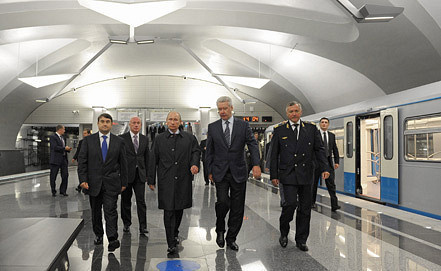 MOSCOW, August 30 (Itar-Tass) — A new metro station, Novokosino, opened its doors to passengers in Moscow on Thursday. The opening ceremony was attended by Russian President Vladimir Putin. The head of state met the metro builders and saw an exposition featuring the development of the Moscow underground until 2020. “Novokosino became the 186th station of the Moscow metro. It’s noteworthy that passengers who are going to use this station will be able to move from Moscow to its outskirts in a matter of seconds. One of the station’s exits is located in Moscow while the opposite one is in the regional town of Reutov. The Novokosino station lies straight on the border of Moscow and the Moscow region. Novokosino is a single-vault subsurface station of the Kalininskaya line (yellow). The staircases are covered with asymmetrical glass pavilions. Novokosino is the first station to be equipped with test sound signals which are supposed to warn people with sight problems of arriving and departing trains. Only new trains launched in March this year will operate on the line. The station has two vestibules – the western and the eastern. They are equipped with lifts for wheelchair invalids. The basic color background is grey and black. The interior, made of natural stones, with a white-grey stucco vault and some stainless steel architectural elements. The vestibules’ walls and pedestrian crossings are faceted with ceramic tiles in contrast with the station. Each vestibule has its own color for the convenience of passengers. The western vestibule is salad green and the eastern one is ocherish orange. The construction of the new over 3.4-kilomerter-long section will improve ease of travel to Moscow’s Novokosino district and will reduce passenger flows at the current end station of Novogireyevo. The opening of the Novokosino station will make metro within walking distance for 70,000 people out of 200,000 residents of the Moscow neighborhoods of Novokosino and Kosino-Ukhtomsky as well as the town of Reutov near Moscow. The new station has extended the length of the “yellow” line to 3.4 kilometers. In future, the Novokosino station will turn into a connection hub that will include stops of urban and suburban passenger transport and park-and-ride lots for light cars. The Moscow metro is a network of 12 lines with a total length of 305.7 kilometers and 185 stations. The metro carries more than nine million passengers daily on week days. This is the world’s biggest passenger traffic. More than 10,000 trains operate on the 12 lines of the Moscow metro every day. The opening of the Novokosino station has extended the total length of Moscow metro lines to almost 309 kilometers.